After selling my laser cutter and a beautifully placed Thursday wedding on the 1st of May, I was hot to trot for a free weekend. So where to go at such short notice, and who the heck is going to have free spaces on a bank holiday weekend, and I don’t want to go too far, I’m not one of those jet setter types. Thanks to the internet I found a great solution to the above listed parameters in the form of the web-site: www.pitchup.com This web-site comes highly recommended by me as you can search for an area you wish to go and the site will bring back results of available campsites with pitches in your chosen area. It has much more information such as pricing and pitch specifics and also reviews. Best of all you can use the site to book the pitch, its a great idea and a great site to use, I won’t book any other way from now on. 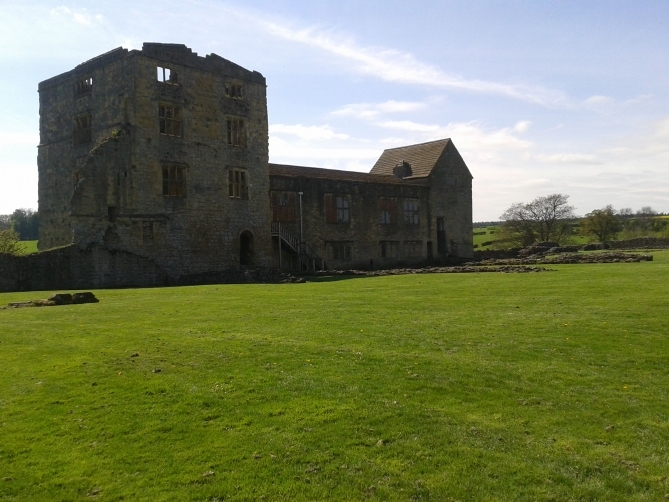 So Helmsley it is then, after looking at all the results and realising this ticks all the boxes. I have never been before but apparently my Grandma and Granddad were thinking of moving to Helmsley many years back. We packed the camper and sped all the way to our campsite as Julie took much longer getting sorted than is really necessary! The campsite was www.goldensquarecaravanpark.com and I couldn’t really fault it. 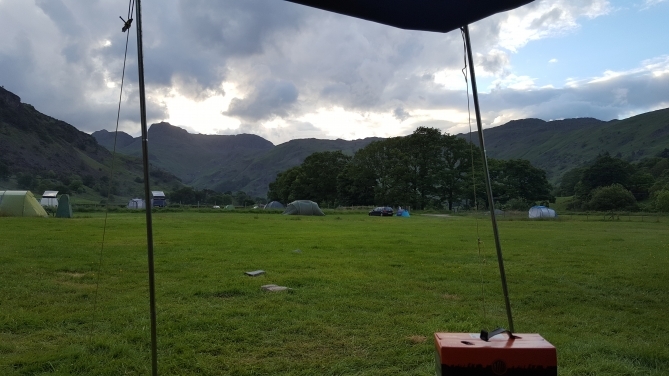 Nice big site, very clean and the sort of site where campers will smile when you pitch up and then let you go about your business. 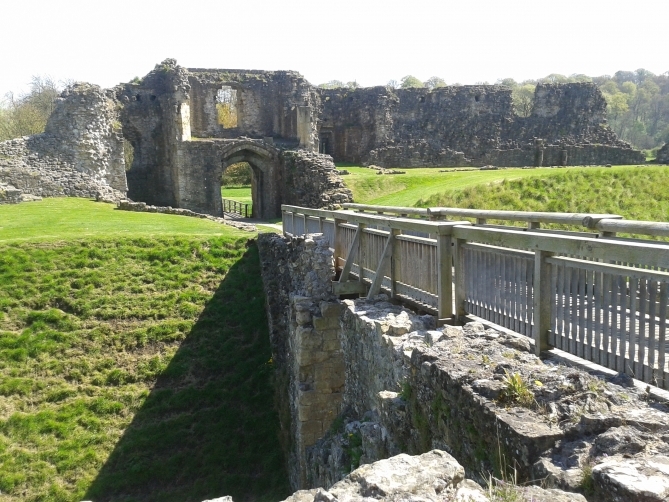 The site is sort of well placed as you can get to Helmsley just around 4 miles from the site and another small village in the opposite direction around 2 miles. If you have kids this site is better again as they have a large park they can play in and a little shop on-site. They have more than this I think but I didn’t look far around the site as we were in the top field near the entrance and not far from the toilet block, so I didn’t need to travel far. The entrance to the site is controlled by number plate recognition but it didn’t work with our camper maybe as it’s an age related plate. All in all a well-kept site, nice big pitches and I suppose not too expensive as we paid I think £56 for 2 nights for 2 adults. That was for a camper and a small tent with electric. As is custom when Julie and I go camping a bit later on a Friday we just get set up, get comfy and get a big hole in a box of wine. 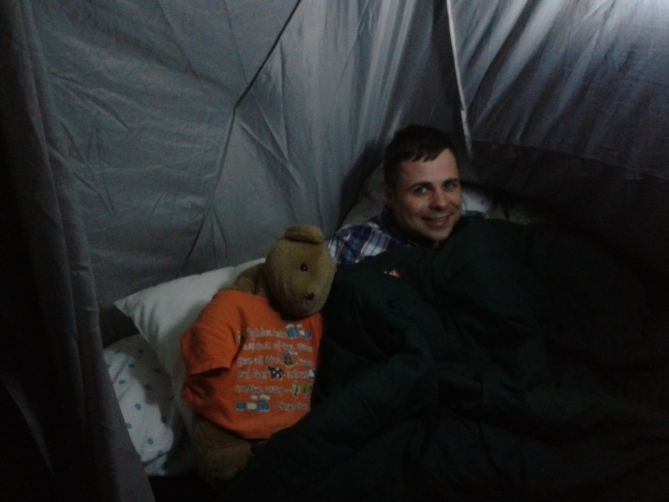 So not a lot of useful information for you on that one, although it was absolutely freezing on Friday evening and night, so we take the edge of by taking a hot water bottle in the form of hot water ted with us (as pictured). We parked in the town centre, short stay car park where a lady who owned the pub beside our parking space warned us that the parking inspectors were on the ball and not to go a minute over our 2 hour parking limit. She wasn’t kidding either. I saw more of the parking inspector than my own reflection that day. 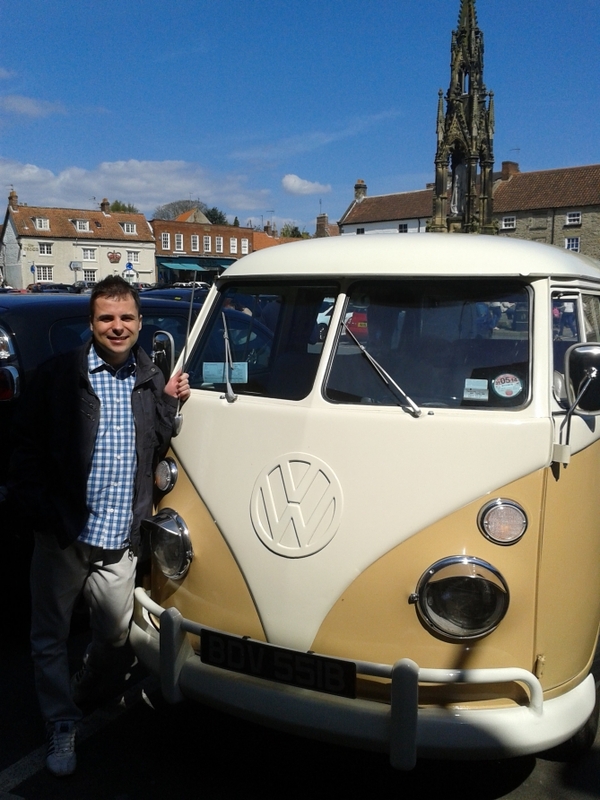 I would recommend parking in the long stay car park as we ended up moving the camper there as 2 hours isn’t long enough to enjoy Helmsley. Item 1 – Get an ice cream. What an ice cream it was as well!. 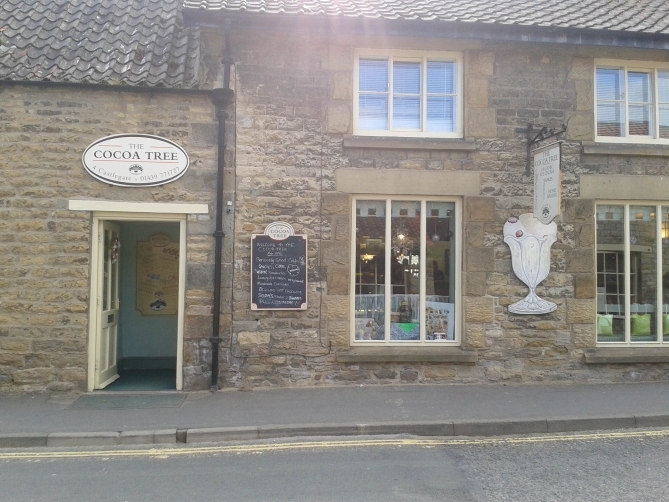 Here is a photo of the shop we got our Chocolate Brownie Crunch Sundae from. The chocolate sauce and the brownies were just so chocolaty. I thought when I saw the Sundae it was slightly over priced at £5.50 but you pay for quality and it was quality. I know desert (or pudding as I call it) before savoury is probably a sin in most religions but not my religion ‘The Pudding First Society’. 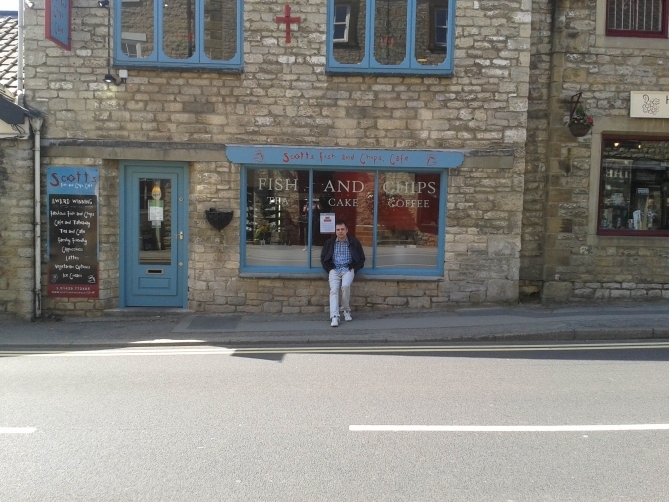 Here is a photo of the shop we got our fish and chips from www.scottsofhelmsley.co.uk . I have never had Whitby scampi before and my Dad is always telling me to try it. As it was on the menu I thought I would give it ago. I enjoyed them and it was a quality product but I am still a fish and chips man I think. As with the ice cream you are paying for quality not quantity here. The chips were perfect as was the scampi and a proper cup of tea made for a lovely dinner. 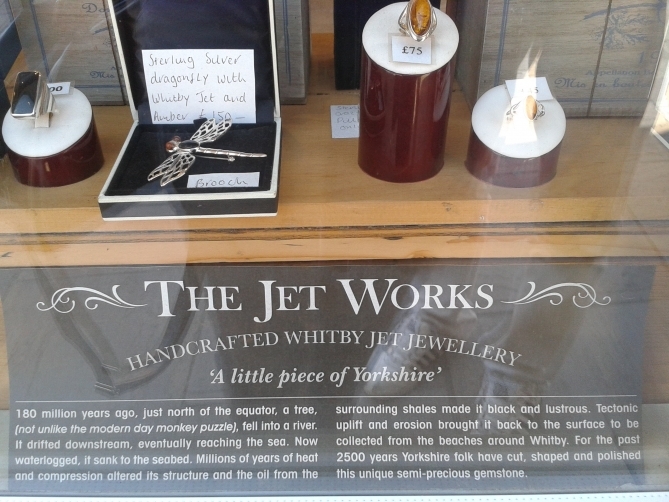 I only went and bought Julie a necklace from The Helmsley Jet Works www.thejetworks.com it was only £28 and I was feeling a little flush after selling my laser cutter. Just goes to show I would be kind if I had money! 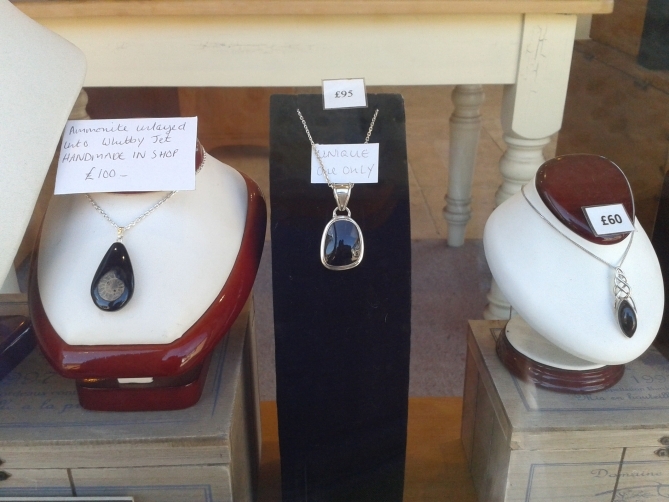 So what is Whitby Jet? I always like to explore something when I am on holiday or climb a hill. Julie has become an experienced high heel hill climber! 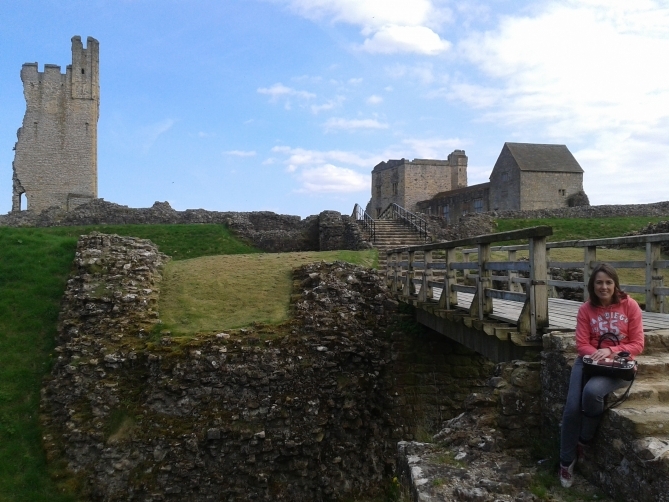 This time, again as I was feeling flush, paid to get in to the ruins of Helmsley Castle. It cost £10.40 for 2 adults and was worth every penny as we stayed for ages. If you go to the castle ask for the recorded guided tour device thing as they don’t give you it automatically when you go in and without it nothing means very much. 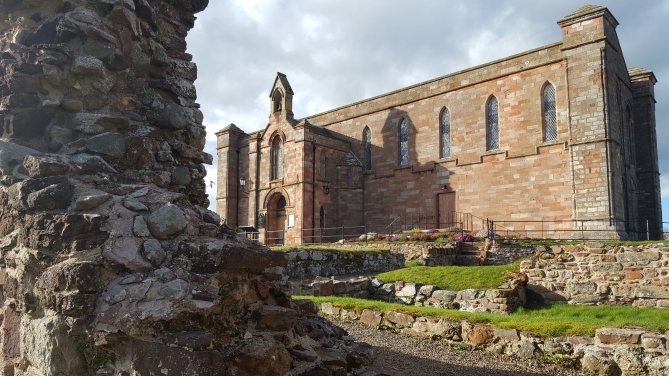 I really enjoyed this as it was a quality ruin as shown in the photos. It’s a sun trap as well on a nice day. Even without the castle you can spend plenty of time looking in the quaint shops or just walking around the village and soaking in the atmosphere and scenery. I think they may be a bit over stocked on sweet shops as I am sure I counted 3 but apart from that a nice variety of interesting outlets. If you are into motorbikes, classic cars or nice racing bikes this place is a feast for the eyes on a busy day as the bikes congregate in the square and I saw at least 4 classic cars as well. 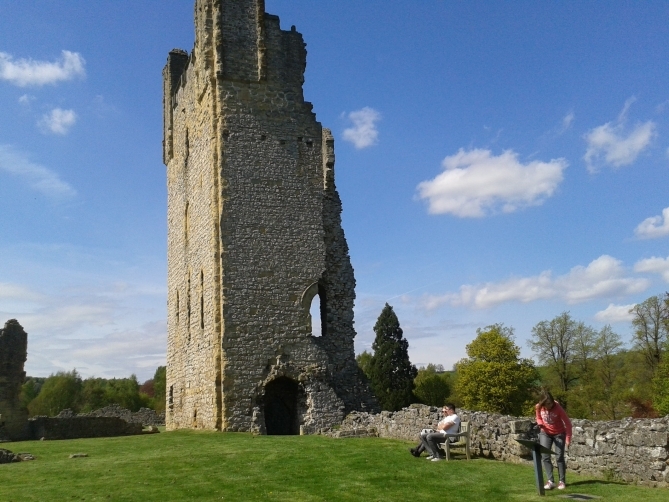 So that was our day out in Helmsley and it was time to head back to the camp-site to get ready for the night. 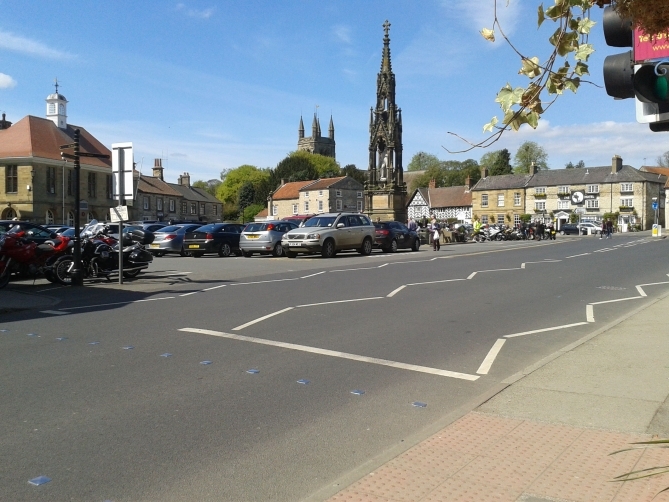 We didn’t go back to Helmsley for a meal on the night but it is free parking after a certain time if you do consider it. We decided to turn right out of the camp-site and walk the 2 miles to the nearest village, we had drove their earlier in the day and noticed they had 3 pubs and I think 2 of which served food. 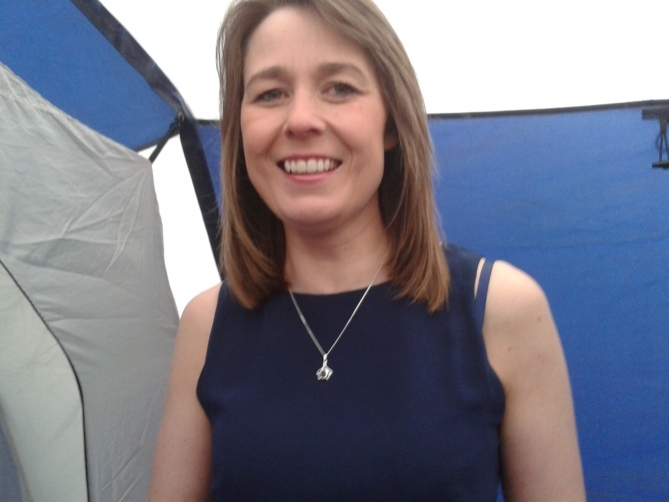 I am not sure if I would recommend walking to the pubs from the camp-site as the road is fairly narrow and the cars fly along, with blind corners and Julie in her heels it was agreed when we got to the pub, we would get a taxi back. We stayed after the meal in the same pub as it had that sort of atmosphere and set up where-by you would be as comfortable going in for just a drink as a meal. This was maybe because we ate our meal in the bar and not the restaurant. The taxi picked us up at 11:30 to take us just 2 mile back to the site. The driver was really canny and almost apologised for having to charge us £10 for such a short journey. I could see why he had to charge this however and we didn’t mind paying it, as a walk back in the pitch black would have been dangerous. I always hate packing up to go home and try and find anyway to extend the holiday a bit before its back to work. 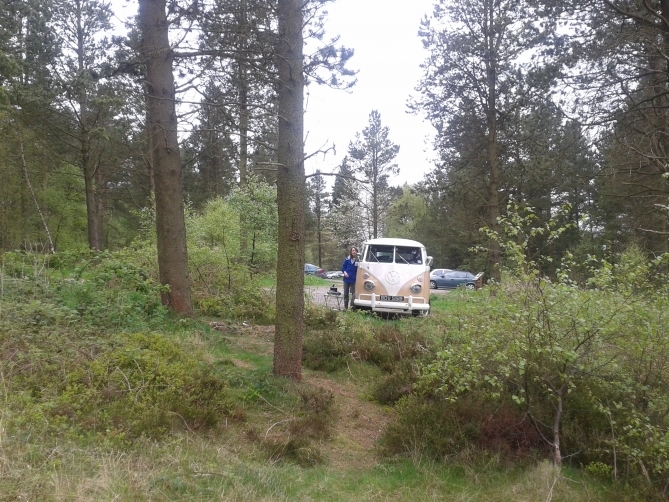 This time we decided to do what all camper owners should do and park up at a random place and have a cup of tea / bit of breakfast. We found a great spot in the forest about 20 minutes away from the camp-site. 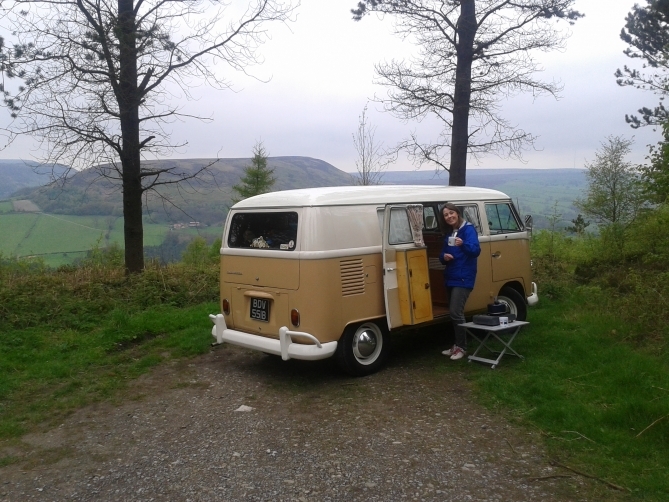 Parked in the best place for the view and enjoyed a cuppa, sausage roll and home-made steak pie. We then went for a short walk before heading properly back home. 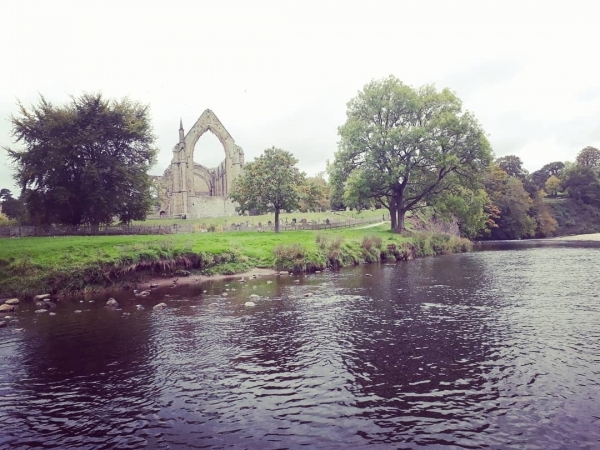 It must have been a good holiday as I have enjoyed re-living it writing this blog. 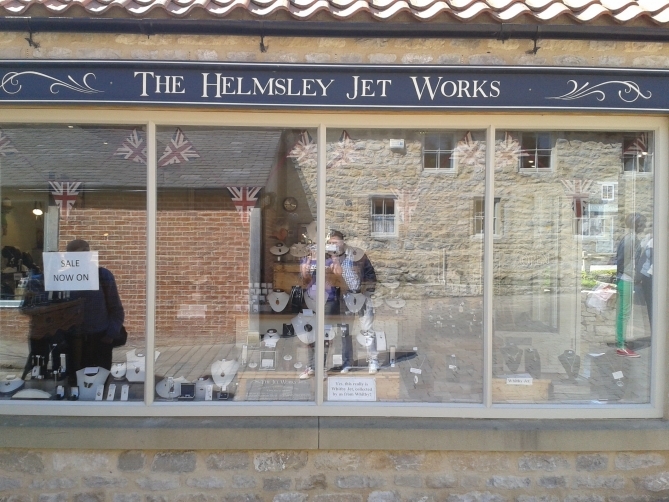 Helmsley we will be back! "Thank you canny campers for making our day special. Nothing was too much bother. Highly recommended for their great service!" 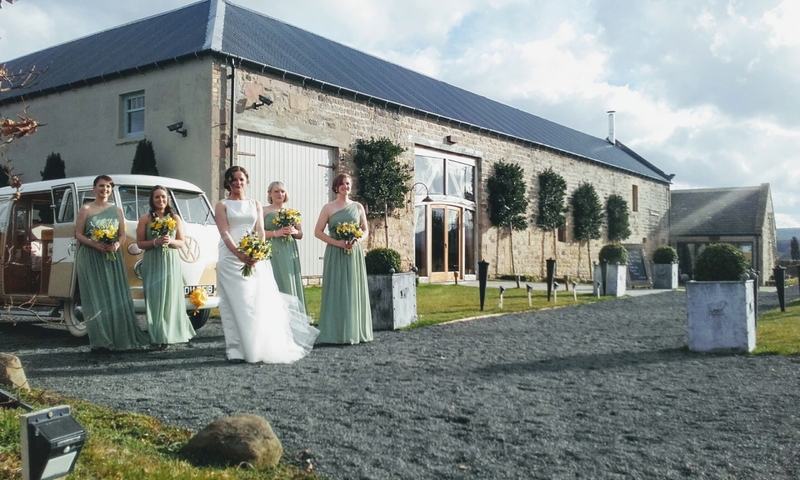 "So pleased we booked the camper van for our wedding, Paul was absolutely brilliant with everything. 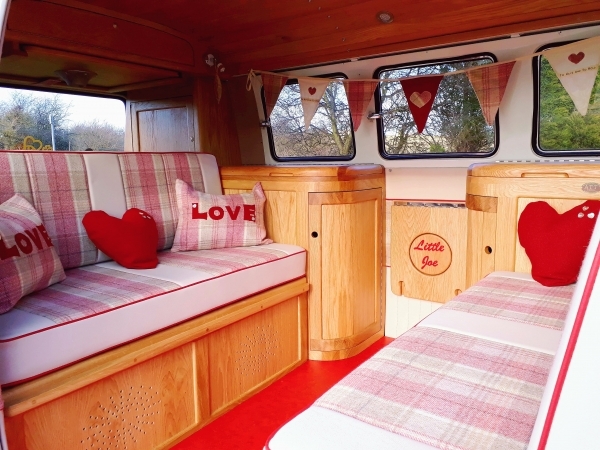 The camper is so lovely inside, the champagne glasses are are great to..."
"absolutely loved it - fantastic service!! thank you so much x"